We have seen our fair share of lace up boots over the past few months, with a variation on the trend set to continue for autumn / fall 2010 (and Spring for us in the Southern Hemisphere) with the good old Desert Boot. Guess what blog readers, I scored myself a pair of khaki desert boots from my local op shop ..for free! Well, blog readers may remember I am de-cluttering which means a stack of stuff has been donated to my local op shop. Ah it feels great having a much clearer wardrobe. However, it would be rude not to have a sneaky nose around the oppy before I head home, I wouldn't want to miss out on anything now would I?! The op shop gods were on my side, with everything in store at half price. I've had my eye on a tan coloured vintage suitcase for a few weeks. It was $10, but remember it is half price week, and that means $5, so I had to buy it of course. It isn't just a random purchase, I bought it for storage space for all of my thrifted fabric! I went to pay for the suitcase when I saw the boots sitting on top of a wicker basket, size 38EUR .. wooot, my size! I also nabbed another vintage tea cup for my little collection. The lady at the counter takes a look at my things and says 'oh just give me $5'. Wow, are you sure lady? Yes she was. So there it is, technically, I got a vintage tea cup and a pair of boots for free.. result! Another positive note, spring is here at last, goodbye cold dark DVD nights, and hello warm light evenings stolling along the beach. An afternoon with my little boy on our local beach with my 'new' boots! My son wears a pair of Sprout trousers (pants) which I got for $3 from Savers, and his 'frankentop' I made myself from three reconstructed adult t-shirts, which I cut up and stitched together frankenstein style. 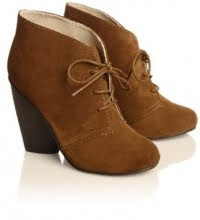 Oh my oh my how the idea of desert boots takes me back to my schooldays! DeeBees we called 'em and wore them with our school uniform ( appropriately hemmed to just below our bums!) with whit ankle socks! So sad that I could not pull that look off NOW!! I think you will totally rock the deebee revival! Love the boots and the suitcase. Yes, the serenity of a nearby beach - we are so lucky! I have one nearby also. Wouldn't want to live anywhere else! I can not wait for summer to come!